Has experienced very fast growth since its inception in 1971. Offers credit based on the number of trips with the airline instead of the total miles traveled. Was the first to offer senior discounts, ticketless traveling, and services for air freight delivery. Carefully considers each applicant so that they are sure to hire the best employees which leads to excellent service for their customers. Offers reasonably priced travel packages with low frills and excellent customer service. Low cost approach to flights that has drawn consumers to their services. Excellent employee relations leads to higher ticket sales as they all work as a team. Purchased only Boeing airplanes to reduce costs in repairs and get a bulk discount on the purchase. 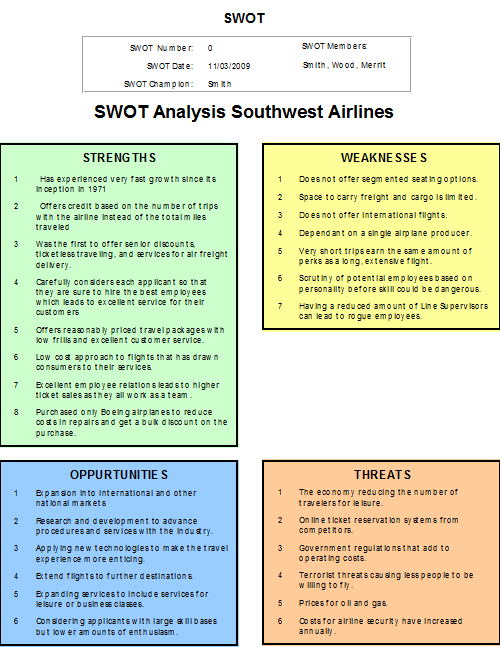 SWOT Manager lets you manage and quickly create your brainstorm SWOTs. Compare the past and track the future. Does not offer segmented seating options. Space to carry freight and cargo is limited. Does not offer international flights. Dependant on a single airplane producer. Very short trips earn the same amount of perks as a long, extensive flight. Scrutiny of potential employees based on personality before skill could be dangerous. Having a reduced amount of Line Supervisors can lead to rogue employees. Expansion into international and other national markets. Research and development to advance procedures and services with the industry. Applying new technologies to make the travel experience more enticing. Extend flights to further destinations. Expanding services to include services for leisure or business classes. Considering applicants with large skill bases but lower amounts of enthusiasm. The economy reducing the number of travelers for leisure. Online ticket reservation systems from competitors. Government regulations that add to operating costs. Terrorist threats causing less people to be willing to fly. Prices for oil and gas. Costs for airline security have increased annually.